Keiron Cunningham hopes Saints devastating cup loss to Hull FC will spur his side on to Grand Final glory. Left with only Grand Final glory as their prime target, apart from the League Leaders’ Shield, the head coach declared: “We were all devastated and stung by the cup result but every cloud has a silver lining and hopefully there will be something for us by the end of the season. He added: “Without taking anything away from Hull, who deserved their success, we reserved probably our poorest defensive display for one of the biggest matches of the season. “Having said that our boys didn’t go out to under-achieve but an accumulation of differing errors brought about our downfall. A shorter than normal turn around in fixtures will give Saints a chance to get back on the horse quickly and Friday’s home game against Salford Red Devils provides the ideal scenario. 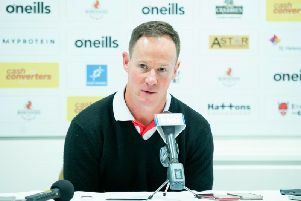 “I am happy we are facing Salford but I expect to see a different looking Saints side on show,” said Cunningham, who will be boosted by the return of winger Adam Swift after a nine-match absence due to an ankle injury. Prop Andre Savelio is also recalled to the 19-man squad which reads: 1. Jonny Lomax, 4. Mark Percival, 5. Adam Swift, 7. Luke Walsh, 8. Alex Walmsley, 9. James Roby, 10. Kyle Amor, 11. Atelea Vea, 12. Jon Wilkin, 13. Louie McCarthy-Scarsbrook, 14. Lama Tasi, 15. Greg Richards, 16. Andre Savelio, 18. Dominque Peyroux, 19. Theo Fages, 21. Matty Dawson, 22. Jack Owens, 27. Jack Ashworth, 28. Morgan Knowles. There is, however, no place for Jordan Turner and Travis Burns. Salford will select from:1. Niall Evalds, 2. Justin Carney, 4. Junior Sa’u, 5. Daniel Vidot, 6. Robert Lui, 7. Michael Dobson, 8. Craig Kopczak, 10. George Griffin, 11. Ben Murdoch-Masila, 12. Weller Hauraki, 13. Mark Flanagan, 14. Gareth O’Brien, 15. Adam Walne, 16. Olsi Krasniqi, 17. Phil Joseph, 19. Logan Tomkins, 20. Jordan Walne, 21. Ryan Lannon, 33. Josh Jones. The game kicks off at 8pm.